On Wednesday I had the pleasure of doing restaurant week for lunch, for once, with my lovely friend and yoga buddy, Rachel Kaplove. It was the perfect menu for us since it offered vegetarian options for her! Also super convenient considering my office is directly upstairs 🙂 We had a great time catching up outside in the beautiful summer sun. 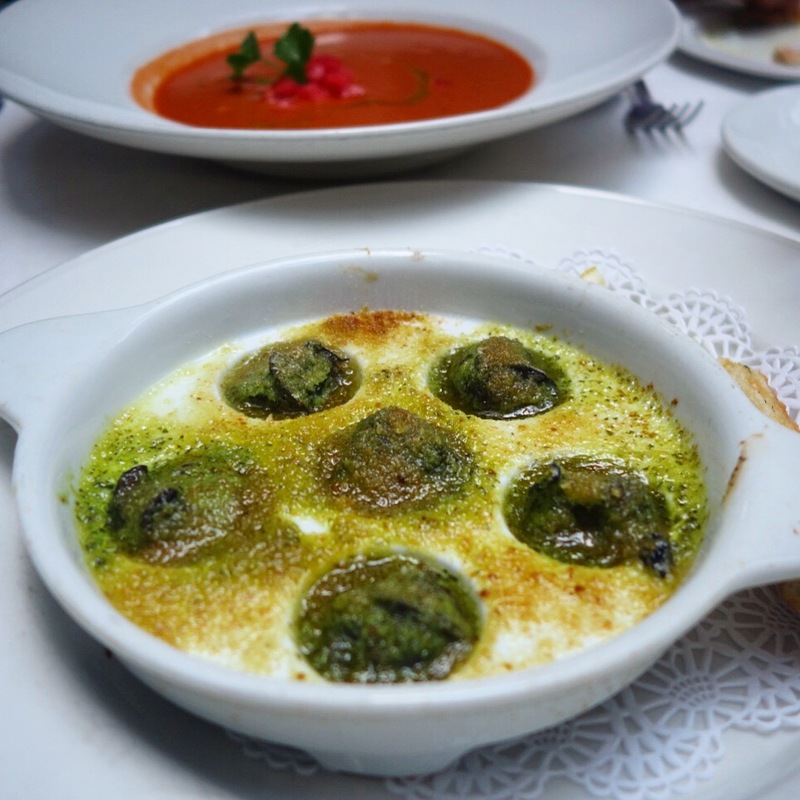 For my appetizer I got the Escargot Burgundy, which I rarely order, but the waiter said it was one of his favorite appetizers, so I went with it. It was delicious, and so garlicky! They are prepared with garlic butter, fresh parsley, white wine and croutons. Sometimes I am a little freaked out that I am eating snails, but the flavor was so good that I ate all of it. I also loved how they had a special plate just for this dish. Pictured in the background is the tomato gazpacho that Rachel had. I took a spoonful and it was quite good. They topped it with watermelon, which I thought may be weird, but it really worked! 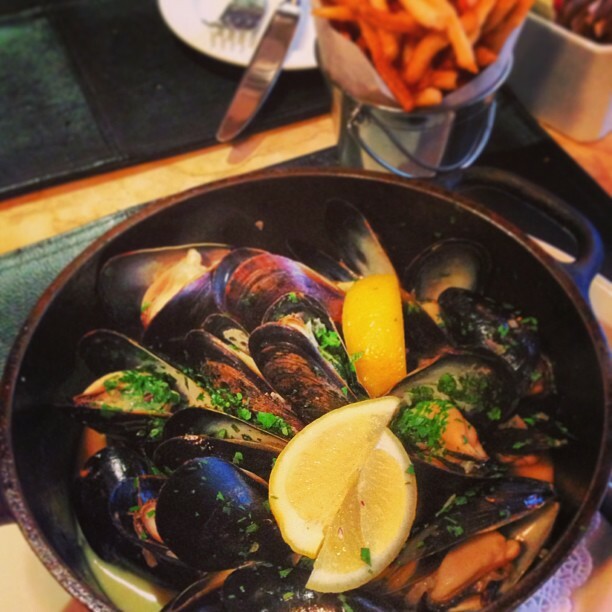 For my main I was going to go with the mussels, because that is what I always get there, and I LOVE them. But the waiter said that the Hanger Steak is the most popular dish from this menu so I went with his suggestion again. It came with roasted potatoes and a romaine heart topped with crème fraîche. I asked for the steak medium and it definitely came out well, but it was still tasty nonetheless. 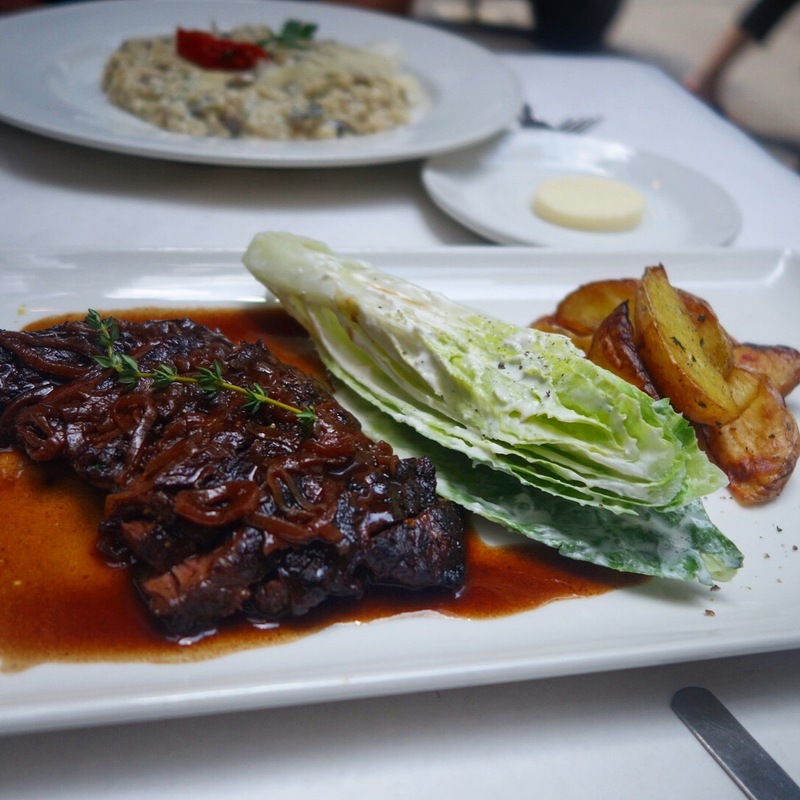 I really liked the romaine heart “salad”. I normally don’t even like romaine at all, but I guess the dressing made it. Pictured in the background it the Porcini Risotto that Rachel had. I took a little taste and it was delicious. I do not currently see this item on the menu, but one time in April of 2013 I brought my co-worker, Meggie Rose Repp, for a birthday lunch for her here and we had the Asparagus Feuillette as an appetizer. It was so pretty and tasted just as good as it looked. 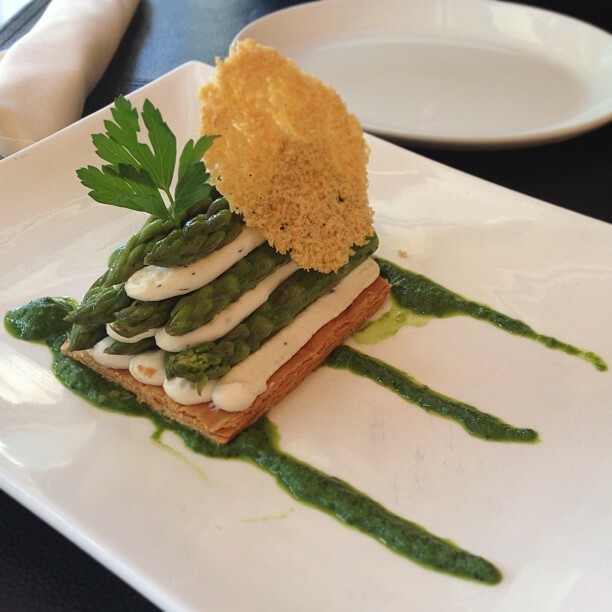 It was asparagus with pesto, light goat cream cheese on top of puffed pastry and then topped with a parmesan tuile. So fresh and delicious. 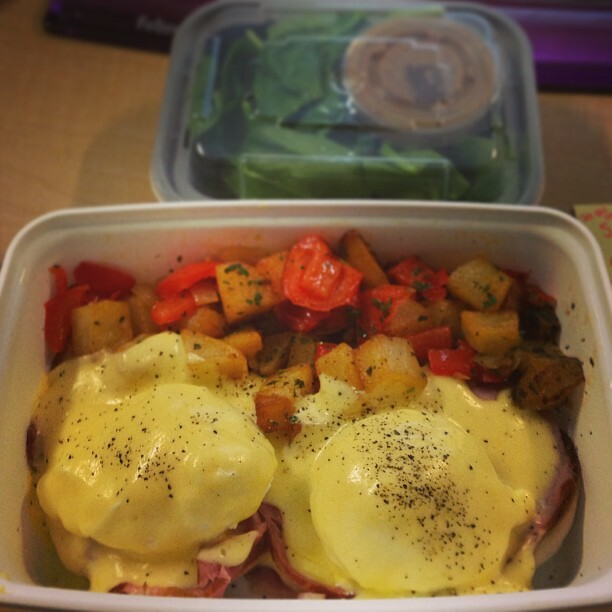 Last, but certainly not least is their Eggs Benedict. I love that I can stop at a restaurant downstairs from work and pick up eggs benedict, my favorite meal of all time, and have it at my desk for breakfast. Their hollandaise is on point and they always poach their eggs perfectly. I like the breakfast potatoes for the most part, but I personally could do with out the red pepper in them, I am not a huge fan of cooked red pepper. I bet other people love it though. It is a decent sized meal considering it also comes with a small salad on the side. I normally save this to eat with lunch later on, but I use just lemon as dressing because I find the vinaigrette that it comes with too sweet for my taste. At $12 for all this food I am a happy camper. I definitely recommend checking this place out at least once. It can be a little pricey, but it is worth it for the flavors and quality you receive in your meals here.